XICHANG: China took one step forward in its ambition to build an independent global navigation network capable of rivaling foreign congeneric systems with the successful launch of a new orbiter into space early Sunday morning. The Long-March-3III carrier rocket lifts off from the launch pad at Xichang Satellite Launch Center, Jan 17, 2010. 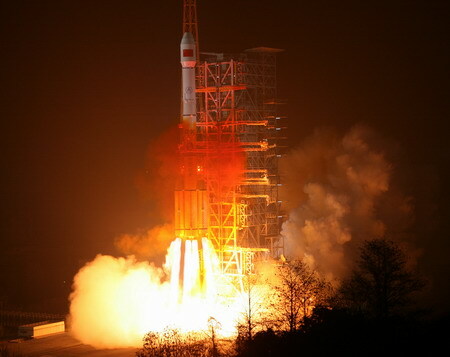 Boosted by a Long-March-3III carrier rocket into a geostationary orbit from the Xichang Satellite Launch Center, it was the third orbiter China has launched for the network, also known as Beidou, or COMPASS system. It will join another two already in orbits to form a network which will eventually have a total of 35 satellites, capable of providing global navigation service to users around the world around 2020. The new orbiter and the carrier rocket were researched and developed by Chinese Aerospace Science and Technology Corporation and Chinese Academy of Carrier Rocket Technology respectively. The network will have five satellites in geostationary orbit and another 30 in non-geostationary orbits, according to a plan for the COMPASS system. According to the plan, the system will firstly provide navigation, time signal and short message services in the Asia and Pacific region around 2012. The COMPASS system will provide both open and authorized services, according to China's satellite navigation project center. The open service will be free of charge for the system's users within service area with a resolution of 10 meters for positioning, an accuracy of 10 nanosecond for time signal and an accuracy of 0.2 meter per second for speed measurement. The authorized service will provide more accurate services for authorized users. China started to build up its own satellite navigation system to break its dependence on the US Global Positioning System (GPS) in 2000 when it sent two orbiters as a double-satellite experimental positioning system, known as the Beidou system. The Beidou system, China's first-generation satellite navigation and positioning network, made the country the third in the world after the US and Russia to have an independent satellite navigation system.